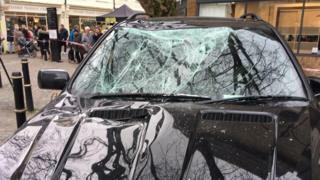 A car crashed on a busy pedestrian area outside Truro Cathedral, leaving at least two people injured and an ancient cross flattened. Officers were called to the collision on King Street at about 11:55 GMT. The driver of a 4x4 BMW was taken to hospital with "minor chest injuries", Devon and Cornwall Police said. A large ancient Celtic cross in the plaza near the cathedral was knocked down and parked vehicles suffered "minor impact damage", police added. The area has been closed to traffic. More Cornwall news and stories. Image caption A pedestrian was taken by ambulance to hospital with minor injuries. Eye witness Sam Wellstead saw the crash. "You could see the bollards literally flapping - dust everywhere - and you could hear people screaming," he said. "I saw the car flip, not on its side, but the tail end basically swung around and then people were running, screaming, panicking."